If you’re like a lot of families, you want your vacation getaway to feel homey, yet you also want to be pampered. Vacatia strives to offer the perfect vacation experience by making it easy for guests to obtain both. Based in San Francisco, Vacatia is a resort marketplace that enables families and friends to combine the space of a home with the services of a hotel by instantly booking stays at residences in dozens of leading hospitality, timeshare, and independent resorts. Amazon Pay streamlines our payment by replacing eight form fields with as few as two taps. It’s absolutely delightful. Vacatia has rapidly grown since its public launch in November 2015, offering rentals at more than 600 handpicked resorts in 29 leisure destinations across North America. To keep pace with the increased demand and decrease friction during the buying process, the company added Amazon Pay in June 2016, enabling guests to book vacation rentals using information already stored in their Amazon account. Mike Janes, Vacatia’s Chief Marketing Officer calls the decision to offer Amazon Pay “an absolute no-brainer,” especially since so many of Vacatia’s guests also order from Amazon. By working with Amazon, Vacatia has also increased customer trust. The majority of Vacatia customers are first-time users, and the Amazon brand gives them the confidence they need to complete their purchases. In a highly competitive space like online travel, time-to-market is critical when introducing new features. 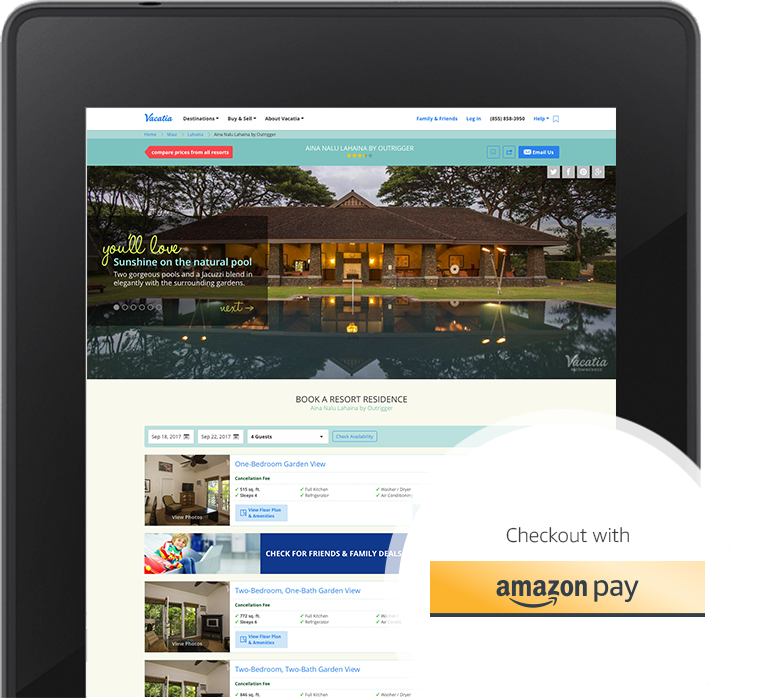 Integrating Amazon Pay into the Vacatia website was fast, enabling Vacatia to immediately improve and differentiate its guest experience. “We were live in a matter of weeks, needing only one backend engineer and a few days of time from a front-end engineer to complete the integration,” says Steven Pennington, Head of Product at Vacatia. We are extremely pleased with the positive business impact of offering Amazon Pay to our guests. Mr. Janes calls Vacatia’s relationship with Amazon Pay a “high ROI” decision. Cancelled bookings are commonplace within the travel industry, as vacation plans tend to change. “Cancellation rates with Amazon Pay are 50% lower than mobile guests using a credit card, which is incredibly material to our business results,” says Janes. “The fraud protection offered by Amazon Pay has also been superior. We are extremely pleased with the positive business impact of offering Amazon Pay to our guests."